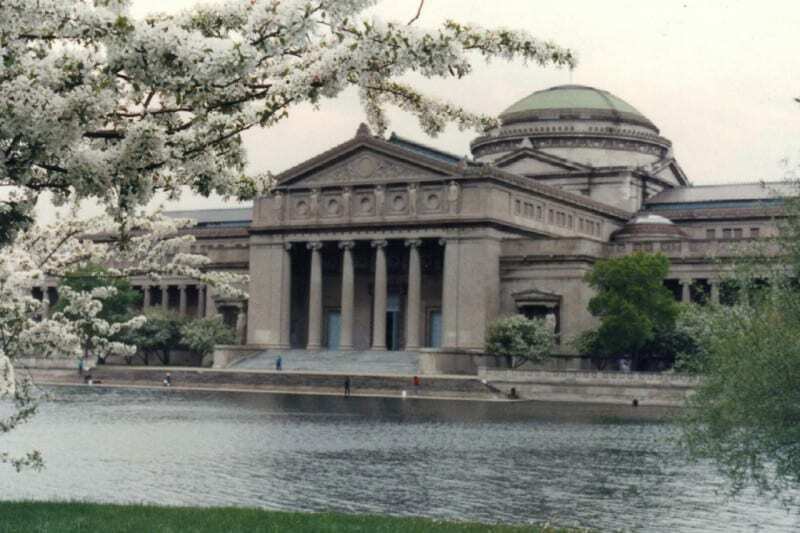 Science Storms at the Museum of Science and Industry in Chicago, IL, is a ground-breaking 26,000-sq.-ft. exhibition in which visitors interact with dynamic, large-scale experiments that explore nature’s most powerful phenomena such as tornadoes, lightning, fire, tsunamis, sunlight and avalanches. They then have opportunities to investigate the science through hands-on experimentation. The 200-ft.-long by 100-ft.-wide by 65-ft. gallery is an ethereal expanse whose surfaces are washed by blue light that creates an indefinite sense of space. The exhibition is anchored by seven viscerally beautiful, large-scale interactive demonstrations of natural phenomena, surrounded by a constellation of smaller experiments. Interactive and linear media throughout the gallery complement the mechanical elements. 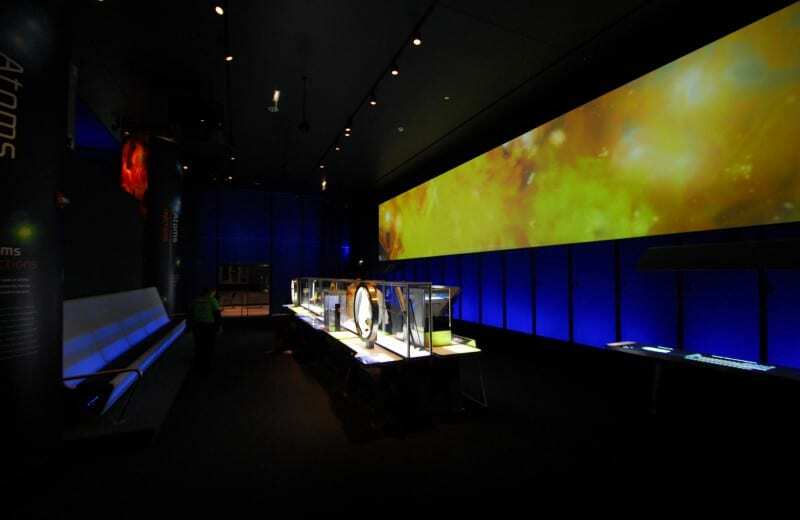 Seven large-scale video presentations feature striking visuals of natural phenomena and stories of scientists who investigate them. The audio systems supporting these shows are designed to minimize sound bleed related problems. Mad extensively used the ‘Haas’ or ‘Precedence’ effect and were deeply involved in the original designs to ensure that speakers were put into the set in exactly the right position such that audio bleed in this huge open gallery could be eliminated as a problem. 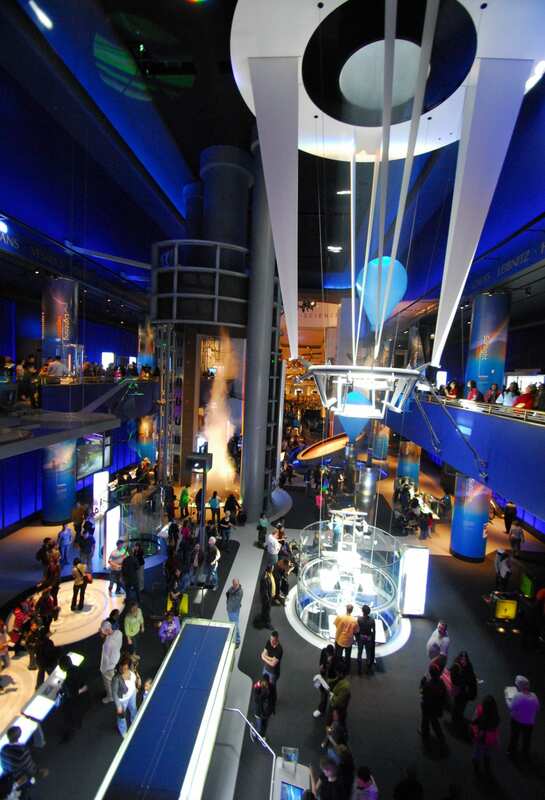 Another one of the main theater at the Science Storms gallery is the Lightning exhibit. The seats have speaker drivers built in such that the seat backs actually become speakers. 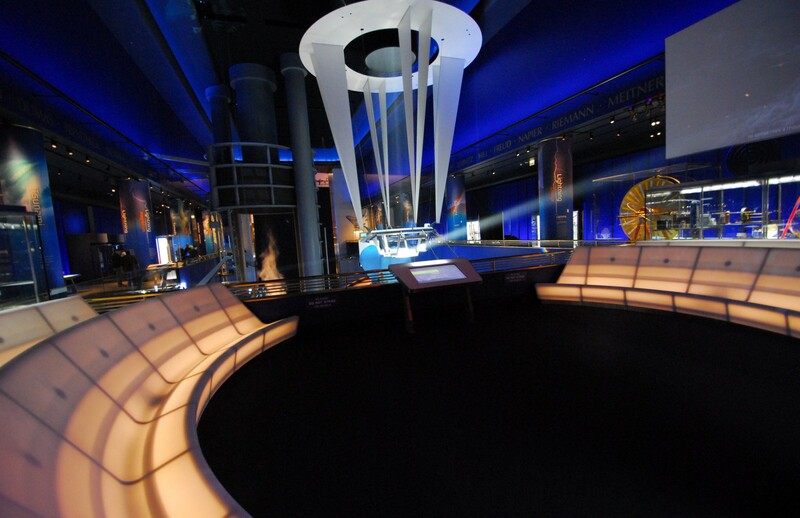 With careful application of speakers, and balancing of all the audio signals, the main show can be running, giving the two sets of visitors seated in the chairs facing the two opposite screens while another visitor can still be using the audio interactive in the middle without any problems. The audio for the interactives at Science Storms depend on speaker cores that are attached to the inside of the Corian surfaces which turns the entire top surface into speakers. Again, this approach is only possible because Mad were heavily involved in the original design of this gallery so that speakers could mostly be hidden in the set, and sound bleed related issues could be taken into consideration and eliminated as part of the original design process. This is another image of the space, showing the signature blue wall panels which were designed and added after Mad’s acoustical analysis of the space showed that additional acoustic dampening was required. Mad tracks the 17′ tall balloons as they traverse up and down into the space, and the deep infra-red cameras give images that show how the hot air in the balloons cools down before the balloons start to descend back onto the color of the electric heater assembly at their bases. 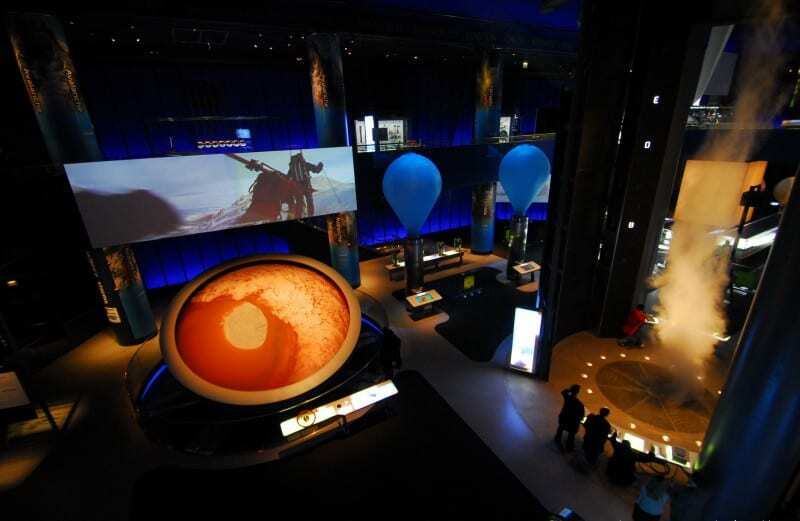 The Avalanche exhibit is one of the several exhibits in the space that uses the ‘Haas’ audio effect to make visitors think that the audio emanates from the two speakers mounted behind the edge-blended projection screen. 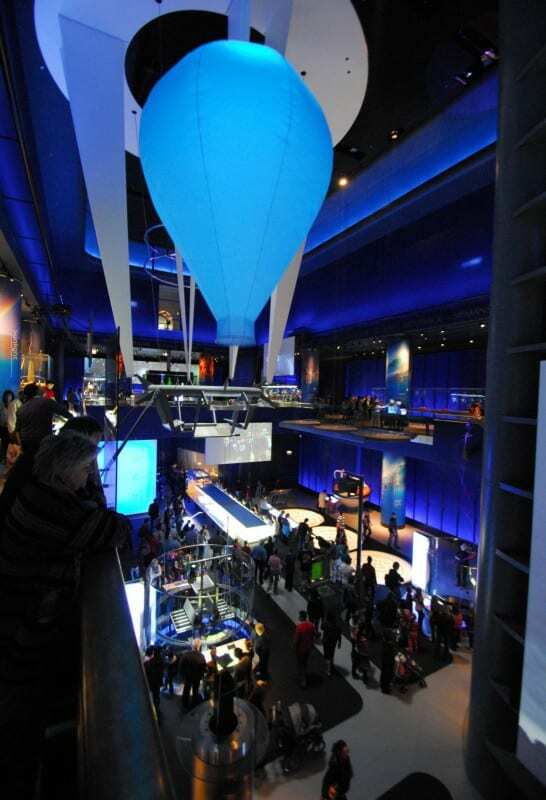 In fact, most of the audio is generated at the two listening stations – one just behind the control of the Avalanche disk, and the second on the balcony opposite, and beam from the main linear array speakers behind the screen are split to cover both of those areas.